Just to let you know the client thought the sample report looked great. The bank valuation is booked in for Thursday, so assuming that comes back at the £90,000 mark, the client would like to instruct you. I will let you know as soon as I hear from Barclays. The client is on holiday for 3 weeks in Australia as of Sunday, but has given me permission to book you in once we hear back. He was a marvellous gardener. The neighbour was right. The garden was perfect. Pity he grew a low hedge up the front wall of the house and porch. (See photographs) This created defects that I had to report. 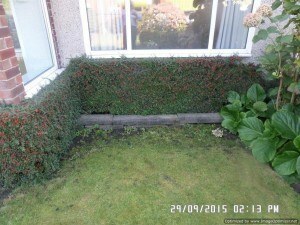 As the hedge prevented visible access, I had to report that it was not possible to fully inspect the external walls and damp proof course. This immediately creates suspicions in the mind of a would-be buyer. Worse, as the house had timber ground floors, it was obvious to a surveyor that the hedge has also blocked up the air bricks ventilating the timber ground floor void. 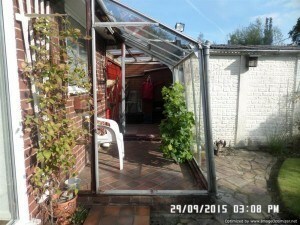 To make matters worse, the owner (the wonderful gardener) had also blocked up the rear airbricks when he built the greenhouse floor. Another air brick was taken out of commission by the contractors who’d installed the cavity wall insulation because they mastic filled it. The reason why air bricks should not be blocked up under timber ground floors is because the air bricks allow the wind to below through the under floor void and prevent wet and dry rot setting in.